Greetings from Blaire, Colin, Owen, and Megan! It’s been a while since we’ve found internet fast enough to upload pictures. We have some adventures to share, though truthfully the last few weeks have been less about exotic places and cultures, and more about good friends, new and old. 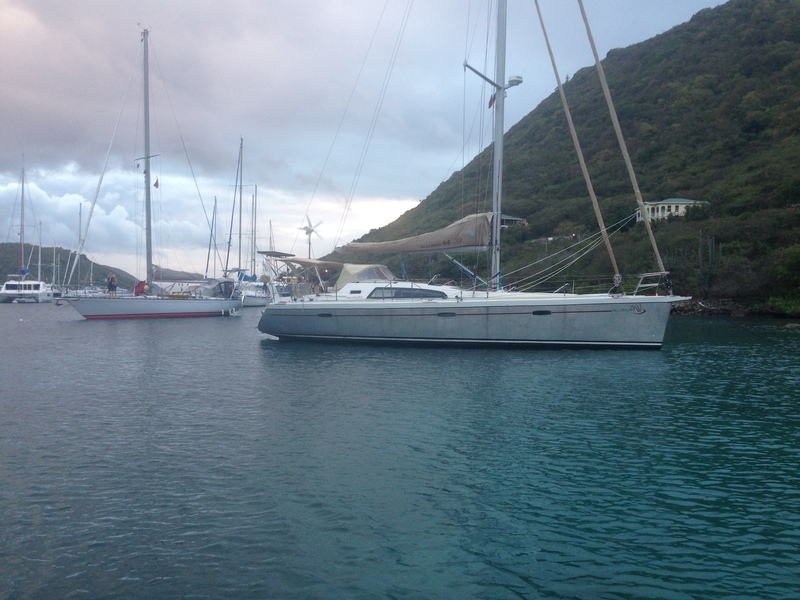 At the end of our last post we had anchored alongside Alchemy in Marigot Bay, Saint Martin. 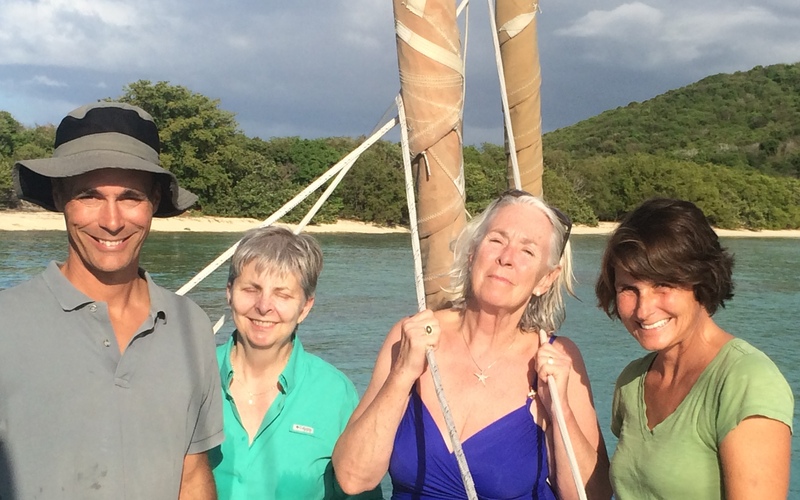 We spent the next few weeks sailing in company with our friends, Barrie and Sarah North, and their crew of young pirates: Peter, Simon, and Andrew. The Farrar kids were thrilled to spend time with cruising buddies. There were water fights, movies, sleepovers, and Lego projects. Together we explored the beaches and cuisine of St. Martin’s French side, and after filling our holds with cheese and wine we embarked for the Virgin Islands. 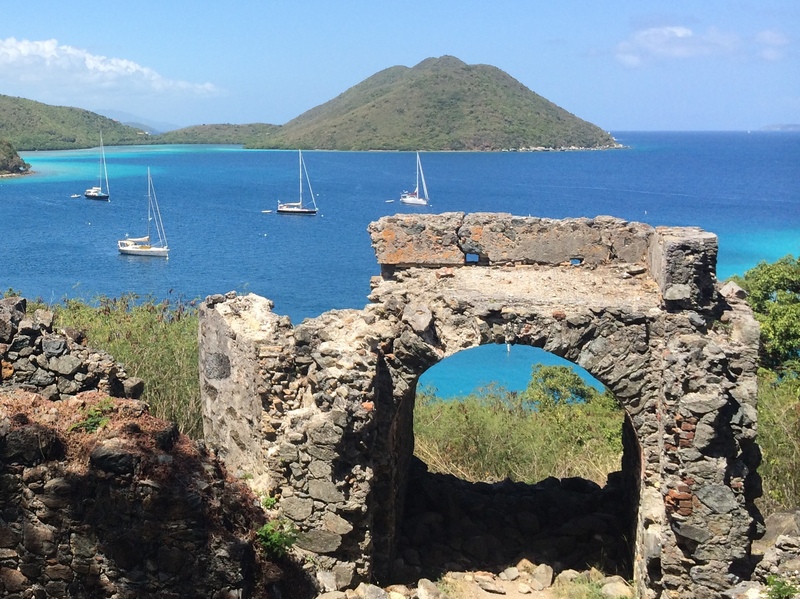 We stayed briefly in the British Virgins and then spent a week at St. John, USVI. 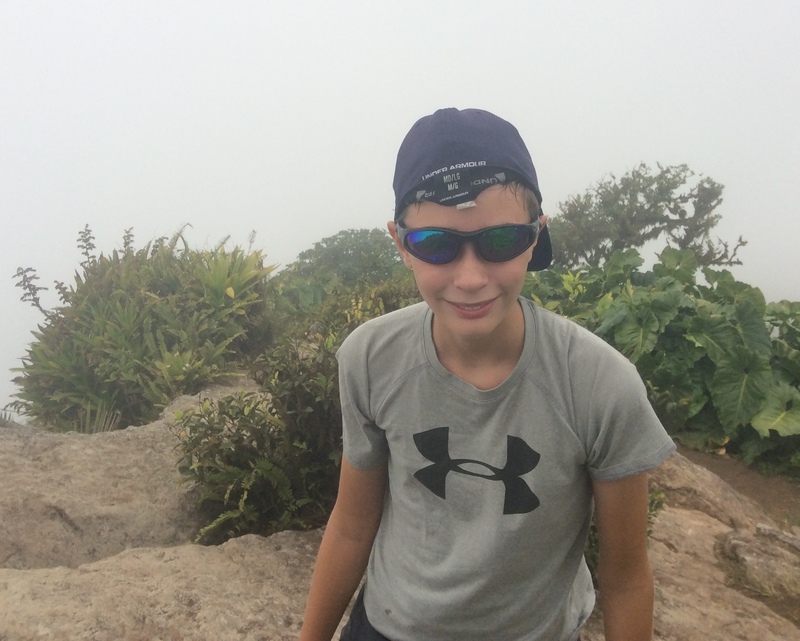 Highlights included a tour of the Annaberg sugar plantation ruins, hiking across the island for a hamburger at Skinny Legs cafe, and snorkeling Watermelon Bay. The towns of St. John were a bit touristy for our taste, but the large areas of parkland help preserve this island’s natural beauty. 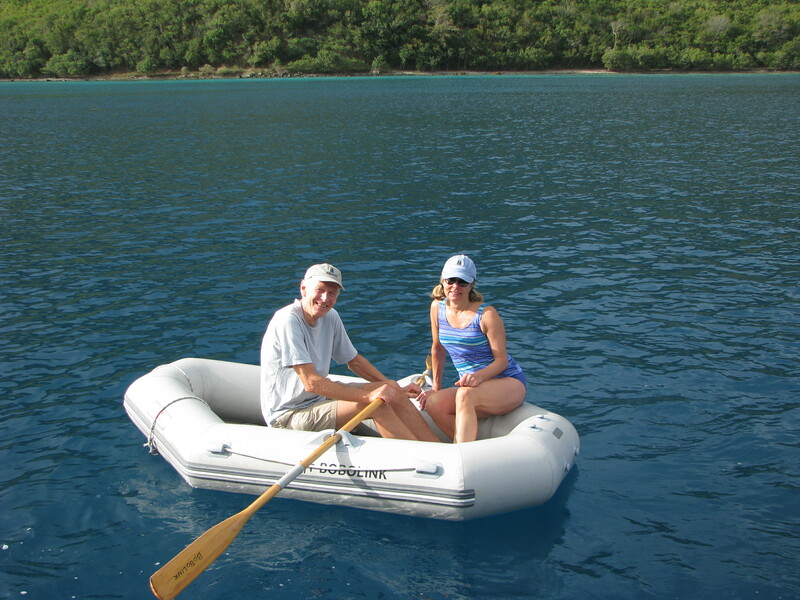 On a nearby mooring we discovered our friends Ben and Diana Emory from Brooklin, Maine. Long-time Caribbean sailors, they shared a wealth of knowledge with us about St. John’s and other islands. We look forward to seeing them, along with other Center Harbor friends, when we visit New England this summer. 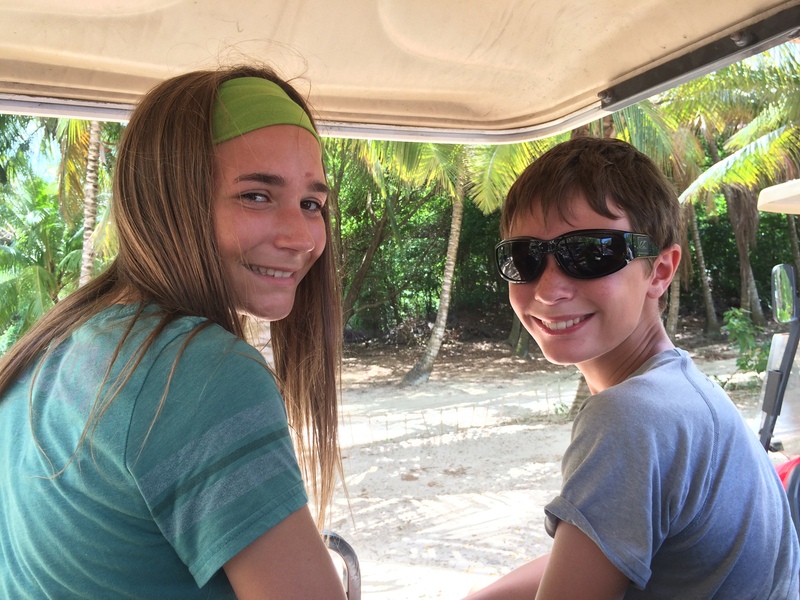 Next, we anchored off the island of Culebra, 30nm east of Puerto Rico and part of the “Spanish Virgins.” Megan and Owen enjoyed touring the island by golf cart. 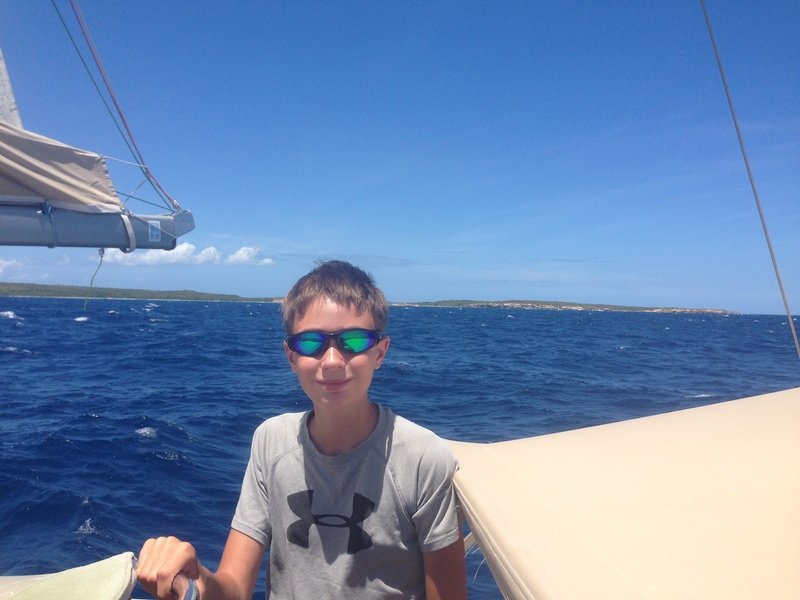 Using the town of Dewey as our base, we also explored nearby bays and islets. 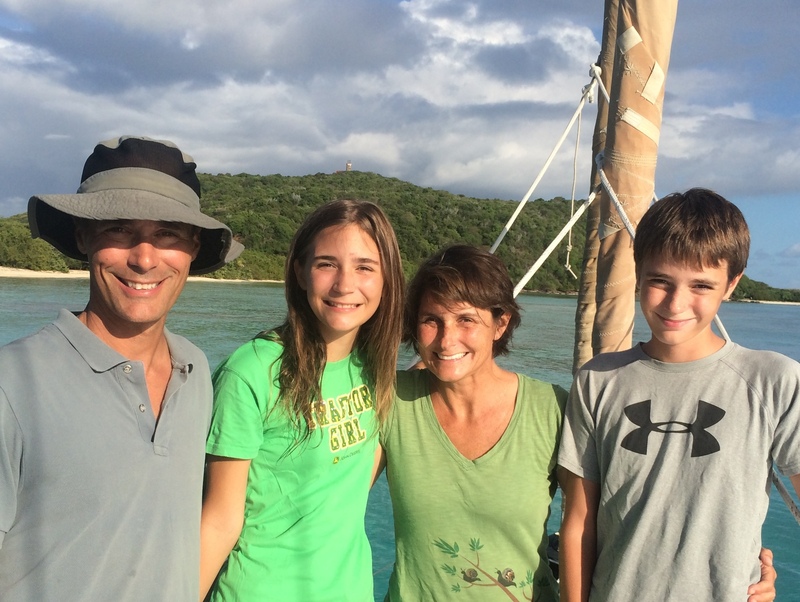 We enjoyed Culebrita, a small island with snorkeling, tidal pools, and an 1880-vintage Spanish lighthouse. The best part of Culebra was connecting with our good friend and fellow Taft history teacher, Linda Chandler. Together with her friend Priscila, we shared dinners, swimming, and sailing. We caught up on the news from Taft, and Linda’s stories refreshed our memories of the joys and challenges of teaching high school. All too soon, Linda flew home to resume her semester, but we will see her soon. 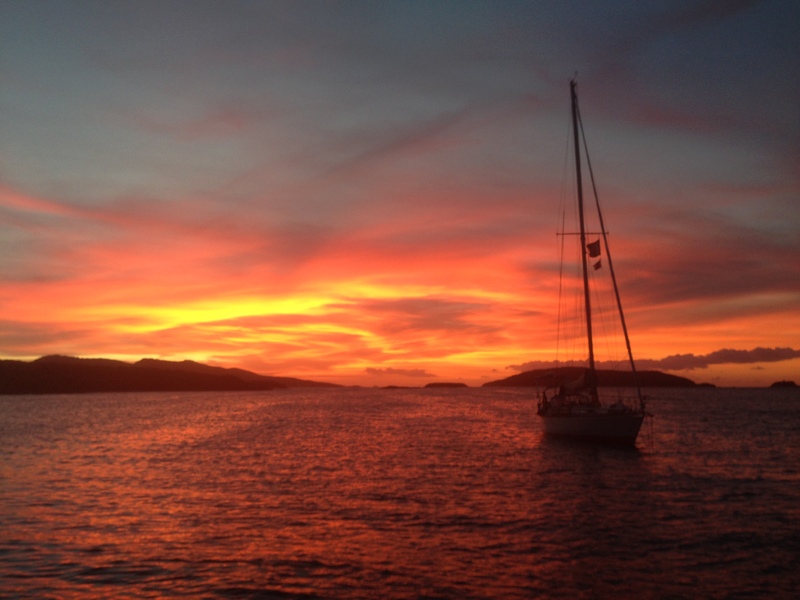 After Culebra, Strider and Alchemy sailed south to the island of Vieques. As Owen steered us past Punta Este, Colin fondly recalled his days dropping bombs on the Navy target range behind the beach. We anchored just inside the entrance to Mosquito Lagoon, and later that evening we paddled into the mangroves to observe the bioluminescence that thrives in this area. We spent a couple of days anchored off the town of Esperanza, where we sampled the burritos and local night life. Finally, Strider turned east to begin the journey back towards Grenada, and Alchemy set sail for Santo Domingo and Cuba. We said good-bye to the Norths – strangers a few months ago and now good friends whom we will definitely visit in the near future. We thoroughly enjoyed our month of good friends and easy cruising in Saint Martin and the Virgin Islands, but we yearned for new challenges. So, we sailed south to the small, rugged island of Saba, which offers little protection from wind and waves but plenty of adventure for its size. We were given a tour by Wayne, a local taxi driver who has lived on the island for over six decades. We were impressed by Sabans’ resourcefulness and commitment to the community’s long-term well-being. If a road, a wharf, or a hiking trail is needed they build it themselves, and they build it to last for generations. Houses are well-kept and painted the same. Despite the appearance of conformity, Sabans are a diverse lot. We heard people speaking Dutch, English, Swedish, Spanish, and Creole – sometimes two or three of these in the same sentence. 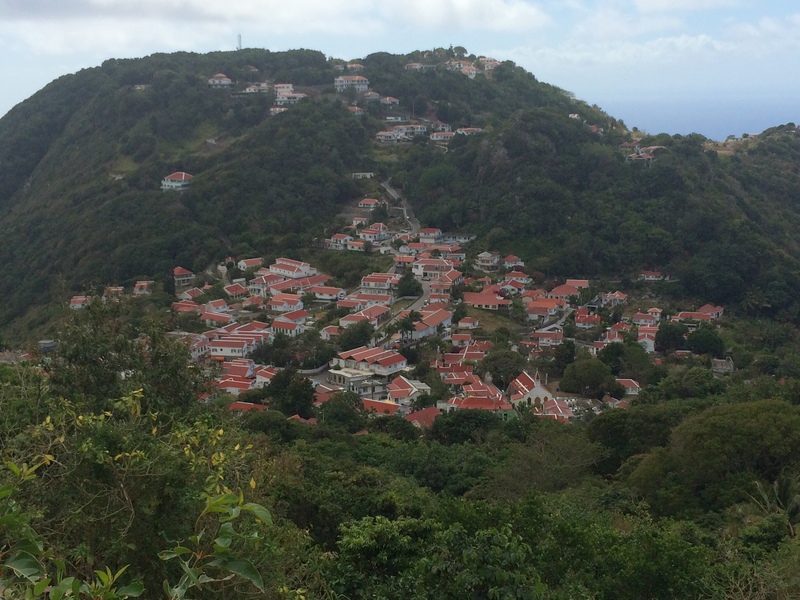 There is evidence of offshore money moving into Saba, as evidenced by the prices of homes and lattes at the local cafe. This seems to be welcomed, for the most part, as only a few decades ago Saban homes lacked electricity and refrigeration. Still, even as the island develops, people seem intent on preserving the island’s character, appearance, and the environment. To gain a view we hiked to the island’s 2910′ peak, Mt. Scenery. Alas, the top was covered in cloud, but the exercise felt good. The next day Blaire and Megan took a half-day course in glasswork, making colorful beads with their instructor, Jo Chambers. 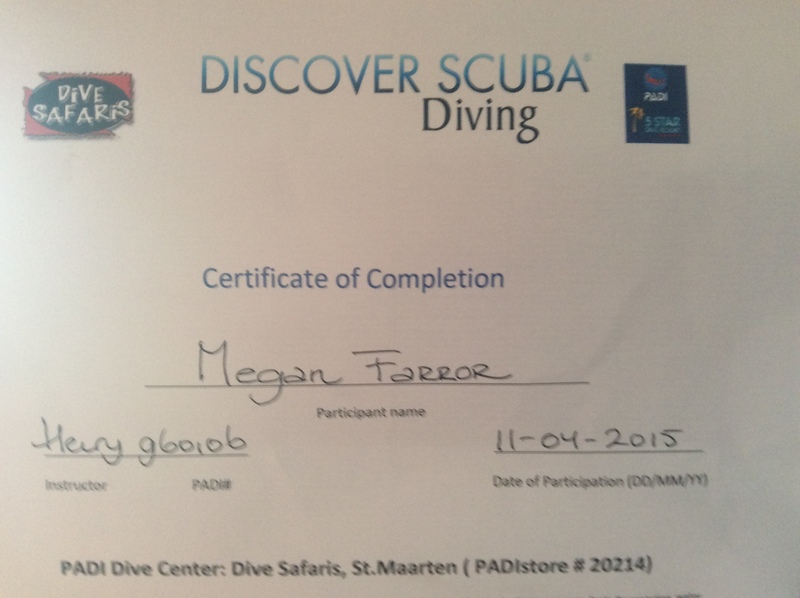 Colin enjoyed the best scuba diving of the trip to date. There were healthy corals covering dramatic rock formations and a stunning diversity of fish species, ranging from a Sea Horse to a Black Tip Reef Shark to a half-dozen Hawksbill Turtles. 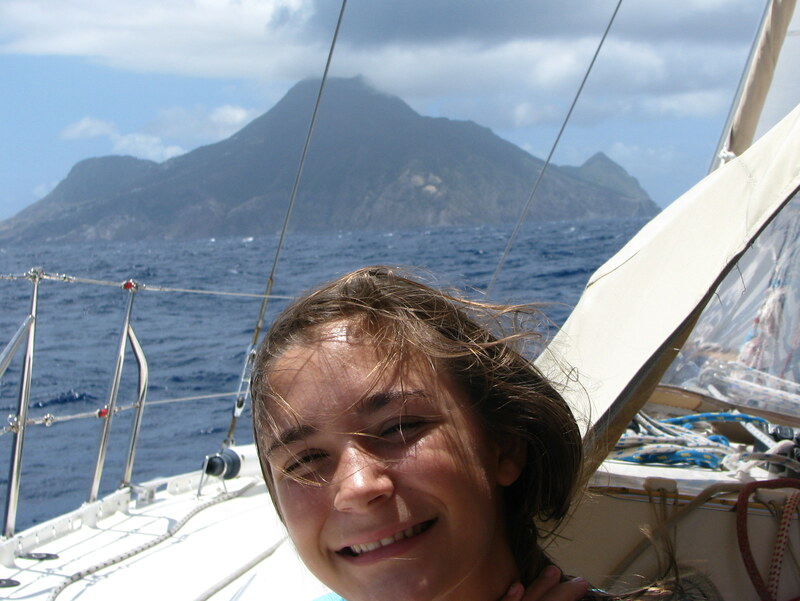 Tomorrow we sail to Statia to snorkel the ruins of the colonial port, then St. Kitts to explore the British fortress, followed by Montserrat to view the volcano that destroyed half the island in 2005. We hope to post about these places soon. Meanwhile, click on the gallery below for more pictures. 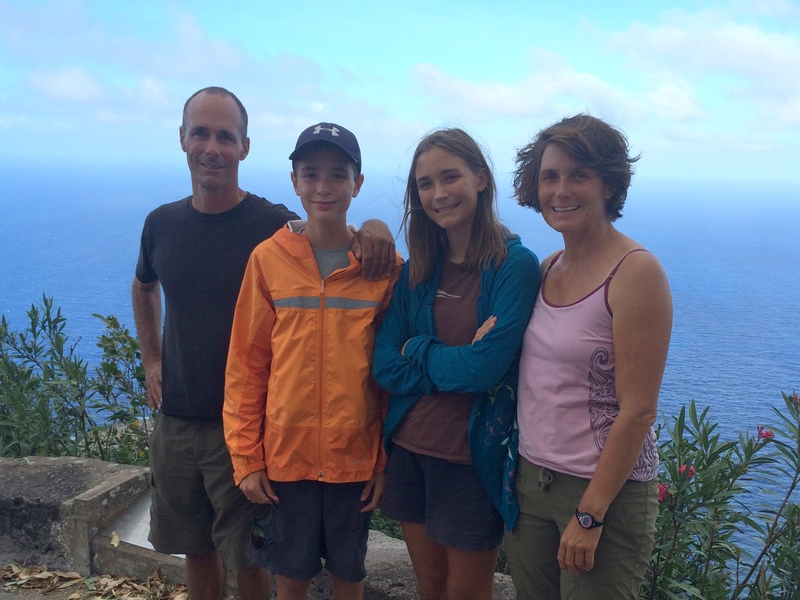 St. John’s National Park: welcome back to the U.S.A.